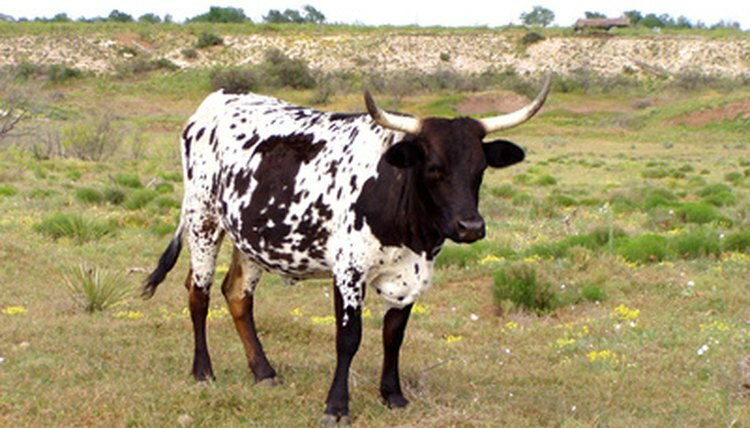 Bulls are uncastrated adult male cattle that are used for breeding and rodeo riding. There are many breeds of cattle such as Angus and Hereford, which are bred specifically for meat and Jerseys, which are bred specifically to produce milk. Bulls are kept on ranches throughout the United States. Bulls typically weigh between 1700 and 1800 pounds, according to Professional Bull Riders (PBR). They eat feed that is high in protein and alfalfa hay, which provides the nutrients needed for a healthy bull. Bulls have four-compartment stomachs and eat strictly vegetation. They swallow their food whole, and then later it is regurgitated into their mouths for chewing. This is what is known as “chewing the cud.” Their lifespan is usually 20 to 25 years. All bulls are different and any one of them has the potential to be dangerous, according to the College of Natural Resources (CNR) at the University of California, Berkeley. A threat display is when the bull turns sideways to the threat, showing the largest profile with the back arched. This may progress to lowering the head and shaking it from side to side. Direct threats are lowered head, shoulders hunched and pawing of the ground with its front feet. It is important to know the threat postures of bulls. When cornered, it is advisable not to move too quickly, but to back slowly away, constantly watching the bull until reaching safety. Withdrawing about 20 feet can avert the dangerous behavior, according to CNR. Dairy bulls in particular should never be trusted. A bull should never be handled alone. It may be helpful to carry a stick, handle, cane or baseball bat to make yourself seem larger to the bull. Bulls that are raised for the purpose of riding receive excellent care. They receive 25 to 30 pounds of mixed grain daily and 20 pounds of alfalfa. They are given a B-12 complex vitamin injection every two weeks. Health inspections are performed each time they cross state lines and they are permitted to travel for no more than eight hours per day. During their transport they stand in six to ten inches of sawdust shavings. Bulls are treated as if they are “one of the family,” according to PBR. To prevent the encouragement of butting and aggressive behavior, bull calves should be stroked under their chins instead of on top of the head. Cattle groom each other in this manner. Calves should never be played with, handled roughly, teased or briskly rubbed in the horn area.